← Everyday Carry, What do You Have in Your Pockets? 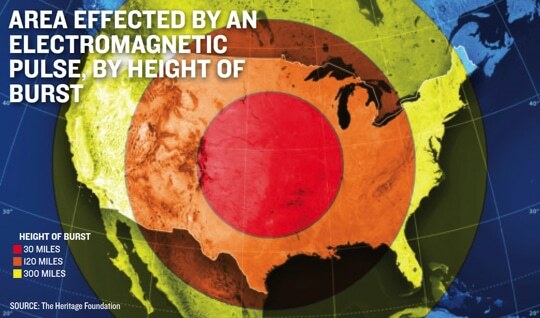 An EMP pulse would occur in just a few one ten thousandths of a second. That is what makes it so dangerous, it occurs so quickly that there is no warning. It is thousands of times more powerful than lightning strikes and occurs many thousands of times quicker. They will only occur as a weapon is detonated and there may or may not be a second detonation. Personally, I would wait at least twenty-four hours to break into my Faraday cages and retrieve any electronic I had stored. The reason for this is to allow time for a second weapon to be detonated. CMP or Coronal Magnetic Pulse is cause by solar storms. Examples would be the Carrington Event in 1859 which lasted 2 days. Intense storms typically last 1-3 days and the surges are like a continuous series of waves. Today we should have from 24 to 92 hours of warning. That’s enough time for the utilities to shut things down in a controlled fashion, if they heed the warning. The dangers of an EMP or CMP event are real. The electric grid is old, in some cases well over a hundred years in age, it also lacks essential backups to prevent outages. According to a 2014 report from the Library of Congress’ Congressional Research Service, “Despite their great size and internal complexity [high voltage] transformers can be readily disabled or destroyed.” Most of these transformers are no longer manufactured in the US. Many come from China. In case of a major event of either type you would expect to have a large scale failure of the power grid that could last from 6 months to years. At the same time, many vehicles would fail and many smaller electronic items would fail. There is a lot of questions about radios and other small devices that were not plugged in, some people think they would survive. There seems to be a lot of confusion in the information that is available on this subject. I would error on the side of caution. You can protect small electronic items by building a faraday cage. A faraday is defined as an enclosure formed by conductive material or by a mesh of such material. Such an enclosure blocks external static and non-static electric fields by channeling electricity through the mesh, providing constant voltage on all sides of the enclosure. The following links provide additional information on EMP, CMP and improvising homemade faraday cages. This entry was posted in EMP and tagged EMP. Bookmark the permalink. 7 Responses to How Long does EMP or CMP Last? There is an important distinction between EMP and CME. A CME will not fry electronics if they’re not connected to the power grid, as an EMP will. Anything connected to the power grid during a CME *may* get fried due to the power surge, but much of that depends on where the surge occurs. IOW, you don’t need a Faraday cage to protect electronics from CME. The big issue with CME and EMP is these events will melt the large power transformers in the power grid, rendering the grid useless. We don’t make nor store these large transformers here in the states, so replacing them after an EMP/CME event will take a Herculean effort by the remainder of the world (assuming they don’t have their own problems to contend with). Strange question, Will a pacemaker inside of a person fail from an EMP or CMP? I don’t know for sure, but I think it is a possibility. Maybe someone out there has a good answer. My understanding of EMP is that it has the potential to induce current in anything conductive. I also recall reading that those massive transformers and other large mechanisms used in the power grid must be ordered years in advance, because assembly takes that long. You are right but a lot depends on the strength of the emp. The smaller the target the better chance the emp will not affect it. Hmmm, My understanding, and excuse me if I’m wrong, (it wouldn’t be the first time) But with the polar fields racing around as they are now doing and scientists talking global “magnetic flip” or “reversal”, and with the recorded rapid weakening of our protective magnetic field that surrounds the earth, any “solar events” need not be strong to adversely affect our “system”. We do live in an electromagnetic universe and I’m afraid our understanding of our reality is greatly limited to say the least. Check out the Suspicious Observers channel here on YouBoob, … They are on the cutting edge of observable and provable sun science. Oh yeah, … what use will electronics that are saved by a faraday cage be if the whole electronic system is down? Radios when there is no signal to receive. I’m pretty sure satellites will be a thing of the past, so there goes your GPS. Phones? Things will be radically different even for those of us who think we are prepared, let alone those who are have totally “bought in” to todays societal structures. Societal structures that are flawed to say the least. Unless you are to argue that eternal wars, millions of starving children in the world, uncountable homeless and destitute, not to mention the horrendous environmental disasters occurring hourly, are the result of a healthy, wealthy, and respectful society. Oops! Getting too real. Sorry. If you have a few solar chargers, you’ll be able to charge these devices indefinitely.